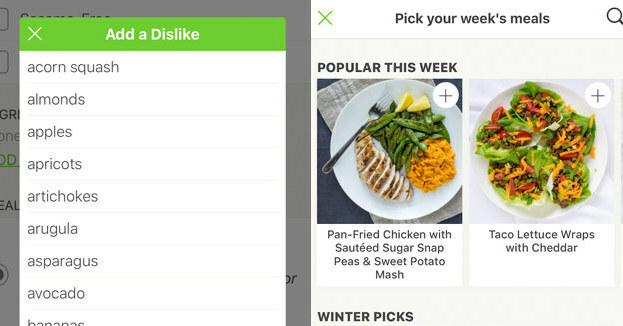 In short, Mealime is a free app that claims to make “meal planning, grocery shopping, and cooking as simple as getting takeout.” And folks, nothing is as simple as getting takeout, but this is as close as it’s going to get. I want to put it out there that they’re not paying me to say this — I just really love this app. But anyway, basically, you create a profile, input your food restrictions and preferences, choose a week of meals from a curated list of recipes, and get a grocery list for the week. And if you really, truly hate grocery shopping, you can import that grocery list straight into your Amazon Fresh or Instacart and have it all delivered to your door. It takes, like, five minutes total. And then yes, you still have to cook the food, but still. This, btw, is all with a free basic account. With a paid pro account ($5.99/month or $49.99/year), you have access to more recipes and features, but they’re not must-haves for me. The biggest thing that a pro account has that the basic doesn’t is detailed nutrition information. But as someone who just wants to focus on eating less processed food and not counting exact calories/fat/carbs/etc., that’s not a deal-breaker for me. In fact, it’s actually really helpful — especially for anyone with a history of disordered eating or eating disorders.